BDK USA Quality Item. The SC-509 series Rome seat covers are officially licensed and designed in Los Angeles by BDK with your CAR SUV VAN auto care in mind. 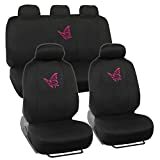 These seat covers are made out of Polyester, enforced with a sponge backing, which can provide specific advantages over natural fabrics, such as improved wrinkle resistance, durability and high color retention. These Seat covers are also water – resistant (BUT not water proof!) when comparing to other seat covers. These seat covers resemble the feel of silk and at the same time not losing the characteristics of cloth. Furthermore, it adds longevity to your original car seats. You can’t go wrong! Best choice for your CAR SUV VAN.